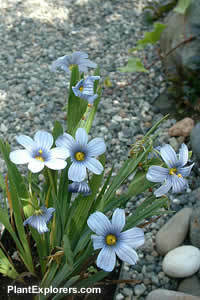 This small semi-evergreen perennial plant forms tufts of grass-like leaves and stems of blue to purplish flowers, usually with a yellow eye in the centre. It blooms from mid spring to mid summer. Height and spread 6 inches. These “baby irises” produce single seeds at the ends of their stalks, and under favourable conditions will self-seed one leaf-length away. For maximum freshness, please keep seed refrigerated in its original packaging until it is time to plant. Sow seed in containers in a cold frame in late summer or fall or store for early spring planting. If planting in the fall, sow seeds in flats or directly into the garden and leave outside over winter for germination in spring. Grow in full sun or part shade, and moist to wet soil.